Arguably the strongest clarifier on the market. Boasting a unique, concentrated polymer resin Miraclear Liquid provides amazing results in a matter of hours. Can be used as an alternative floccing agent to Alum compounds. 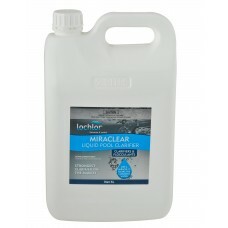 Lo-Chlor Miraclear Liquid Pool Clarifier is a great alternative where floccing is not an option? (55MFP1L): LO-CHOR MAXI FLOC PLUS 1LITRE HEAVY DUTY Liquid Flocculant. A specialised blend of ..
(55MC50G): LO-CHLOR MIRACLEAR CUBES 50GM The Amazing Clarifier In A GEL CAP. The original CONCEN..